Happy Friday beauty bloggers! I've been really happy this week and I'm sure its had something to do with the weather, I really like this warm, settled late Spring weather, everybody seems so much happier and relaxed and I love not having to bother with a coat! Of course, its now raining as I type this - typical. I've been a bit obsessed with gradual self tanning lotions this week. Now that the sun is out my legs have made an appearance to the world and boy, did they need some help colour-wise! I'm testing three tanners as I'm going to review them in a blog post in the next week or so. So far I've pretty much discounted one of them but the other two I like, just not sure which I like best yet, one of the ones I'm testing is pictured above, Garnier Summer Body. I got this for £5 in Superdrug, so far so good (its definitely fast absorbing) but I will review in a separate post. We went to the local village fair on Saturday, it was a lovely day and I wore a dress! Yes, an actual dress. My legs finally saw the light of day, they are still getting over the shock - lol. The one in the photo is my absolute favourite summer dress, I got it in the Monsoon sale last summer and I've worn it loads and loads of times, I love it because it washes so easily, dries and doesn't need ironing (I loathe ironing). I entered our dog in the dog show and he didn't win a single rosette! I was officially offended for both of us! I thought he would at least win "Most Alluring Eyes". The dog didn't mind at all, he was too hot and bothered to care, bless him. No poorly children this week so I've had a little bit more "me" time. Other than the magazines, which are pretty much all about the Beyonce and JayZ thing with her sister Solange (I've still not really worked out what happened in that lift) I've also started to read through my 1001 Beauty Miracles book. I've had this book for ages, its one of those ones you can dip in and out of because its full of tips in short paragraphs so easy to read (and remember!). There's some great beauty tips in there, and a few easy face masks (mashed banana etc) which actually I think I'll try. I also had to re-read the end of the Harry Potter "Goblet of Fire" book because my 9 year old is reading it at the moment and he keeps asking me questions about it and I can't blinking remember the story! Well, I am hooked on the Tina/Peter and Maria/Tyrone story line in Coronation Street (apologies to anyone who doesn't watch Corrie), I've watched Coronation Street on and off for years but I'm on a roll with it again much to my husbands amusement. As I said to him, I've got a vested interest, we live only a few miles from where its filmed plus I keep bumping into the actors/actresses in the local Sainsburys (when they're out of character). Just so you know, TV doesn't put 10lb on you any more, they look exactly the same as they do on TV! I was really pleased when the new series of The Big Bang Theory came on E4, I love this programme its just so, so funny. My favourite character is Sheldon but I love Raj as well. I think I must be the only person in the world not to have seen the first series of 24 (I must have been living on another planet) but I'm watching this new one because hubs is watching it. To be honest I'm not sure what's going on but I'm enjoying it anyway, its very fast moving and its got some great actors in it. There's 20% off online and in store at the moment, I shall be taking advantage of this as I love their fitness clothes, particularly their vests for yoga and pilates. Some good bargains this week, there's a save £7 on big brands (Diesel, Armani, Marc Jacobs, Hugo Boss, Gucci) and you get a free gift with some of these products too. There are special offers on perfume, fake tan, beauty tools and some skincare products until midnight on 26th May, there are some serious offers here, up to 50%, worth a look to see if your favourite is on sale. There's also a sale on Decleor products up to 75% off RRP. Some nice offers on handcare duos and free delivery when you spend over £25. Hope you all have a good bank holiday weekend (here in the UK), see you next week. Happy Thursday everybody! The other day I took advantage of the fact that I was by myself in the house (well, apart from the dog who refused to get off the sofa which is why he's there with me in the video!) and made a little film about my latest shopping haul(s), its all products I was going to review for the blog but it would just have been a lot of really short posts so I thought I'd put it all together. Its a bit of an eclectic mix but that just reflects me - a bit all over the place! Happy Wednesday Beauty Bloggers, hope this week is going well for you. I've got a lipstick review for you today. I've probably mentioned before that I've got a bit of a thing about long lasting lipsticks, I don't really mind re-applying my lippie during the day but I'd rather not have to bother so whenever I find one that claims to last a while I always try it. My latest purchase is this one, Revlon ColorStay Ultimate Suede, No 095, in Finale. I think it's quite a strong colour, it looks very pillarbox red, but when its on (and eventually when it fades a bit) it tones down to a reddish/dark pink. Sorry, I'm not explaining myself very clearly here but I think you might be able to see what I mean from the photo! I was pleased that it lasted too, through cups of tea and lunch and actually pretty much all day. I found that when it faded it did fade from the middle of my lips first, thus leaving what could have ended up as a rim which I hate but I think I probably need to be a bit more careful in my initial application of it, its a strong colour and probably could have done with maybe a lip primer, blotting and re-applying when I put it on first thing. I wore it to a wedding the other week and was really pleased with it, it only needed a small touch up after the wedding breakfast and actually I could have got away without it. The other thing I like is that being such a strong colour its also very season friendly, it goes with the spring and summer wardrobes really well and I think it would pretty much suit most skin tones. Here's the link to the Revlon website showing the lipstick and other colours you can get in the same range Revlon ColorStay Lipsticks. Interestingly, you can see from the Revlon website that Finale (which is the colour I'm wearing) looks very pink in the picture when in actual fact its quite red. Just goes to show that what you see on screen isn't always what you get! I've got a couple of other lipstick reviews in the pipeline and I'll be back in the next couple of days with this weeks' round up. Welcome to the May Bodywash Collection, there's only three this month but they are all a bit different from each other, it makes for an interesting array in my shower! Out of the three pictured below, my favourite this month is the Radox Coconut Kiss, as its the one I seem to have used most of. I must confess the thing that drew me towards this bodywash was the price because it was only £1.00 (I do love a bargain) but when I started using it I knew I'd go back and buy it again regardless of what price it was. For anyone that loves the smell of coconut, this one is for you. Its extremely creamy and moisturising and has a proper coconut smell, in fact it smells a bit like a Bounty bar you're sort of wondering where the chocolate is when you smell this. My skin felt moisturised all day after using this, which was particularly good as I'd been caught by the sun when I was out on Saturday (shoulders, missed a bit with the SPF) and my skin was a bit sore, and I found this very soothing. There are others in this range, though I think they are all fruit smells which I'm not so keen on but I still might try them. Wow, this stuff wakes you up for sure! If you've got a blocked up nose it'll clear it, no doubt about that. I love mint, the taste, the smell, my favourite ice cream is mint choc chip so I knew this was probably going to be a thumbs up from me. As well as being minty (the bottle tells you how many mint leaves its got in it) this shower gel has the added bonus of Tea Tree oil which as far as I'm concerned is the cure for all skin evils. You can really feel the tea tree tingling as it mixes with the mint. Now, this isn't the most relaxing shower you'll ever have because you'll be acutely aware of the smell but its certainly invigorating and while I didn't find it a particularly moisturising gel it didn't irritate my skin either which was good. The only thing I don't like about this is the packaging. I don't like the flip top lid, for some reason I found it fiddly to open and with this bottle if you squeeze too much you get too much gel and if you don't squeeze enough you don't get any at all. But they are just my little gripes, I know this brand has been going for years so they must be doing something right! What can I say about this? It's Champney's so I'm only going to say good things. I went to a Champney's Spa a couple of years ago with my Mum and sisters and it was great. Their products are gorgeous, so luxurious and this doesn't let you down, this one has coconut oil (coconuts again!) and milk proteins in it, both of which contribute to the very soft skin you end up with. I think this was a present but I've seen Champney's products in Boots and you can buy them online here at the Champney's website. As it happens I see they are on sale at £4 online at the moment so grab yourself a bargain before they run out! Hey there, hope you're enjoying the beautiful weather this weekend, I can't believe its been so gorgeous outside. I seem to rattle on about mascara for the last minute or so, not sure why, sorry about that! Anyway, enjoy the rest of the weekend. Welcome to the weekly round up beautiful people, hope this week has been good for you. Here's what's been happening this week. This week is Mental Health Awareness Week and the theme this year is anxiety. I'm not sure how well publicised this has actually been and I think its important which is why I'm mentioning it. I'm not going to blether on for ages in a "woe is me" type of way but just wanted to say that I've had anxiety and panic attacks over quite a long period of time now, I had my first panic attack at 22 and I'm much older than that now and I still get them on occasion when I'm really stressed or anxious so I do have some experience of this. I've also had beta blockers twice to help with anxiety, they worked and they did make me feel better. All I would say is that it is really important to get help when you feel overwhelmed, anxious or like you can't cope. It took me a long time to realise that there's no shame about reaching out to someone and saying "help". It doesn't mean you're weak if you ask for help, it just means that you are being proactive and are doing something positive about it. Its also worth saying that we need to look out for each other, sometimes it takes a close friend or relative to gently point out that you're not yourself and be there to give you some support. That's what Mental Health Awareness Week is all about, being aware of not just our own mental health but that of those around us too. So here is the link to the Mental Health Awareness site there's loads of helpful literature on there, I think its well worth a look. I haven't managed much reading this week as my youngest son was poorly until about Thursday so I haven't had much free time but I'm still working my way through the Anti Ageing Beauty Bible, it really is an interesting, informative book in a non-preachy way. When I've finished it I will review it and in the meantime no doubt I'll be sprinkling my posts with little bits of information I've gleaned from there! I've also been flicking through Cosmo Body and Look Magazine (think it was last weeks). This week I've been wearing an eyeliner I've had literally for years. Its by Givenchy, and its blue! I bought this eyeliner in New York in Sephora when I was there on my honeymoon, it was probably one some kind of sale as that's the only time I would be able to afford anything by Givenchy but anyway, I'm digressing. I've been wearing it this week as I've sort of lightened my eye make up now that we're on the way to Summer (lets discount the huge amounts of rain we had earlier in the week ...) and I'm so glad I've rediscovered it. Its more of a navy blue, I don't use much just a touch and I really like it. It took me on a trip down memory lane, my very first eyeliner that I ever bought was blue and it was from Avon, it was what everyone was wearing to school, we thought we were so cool though none of us had a clue how to apply it, some of us looked spectacularly awful - lol. So I have a fondness (and a history!) of blue eyeliners. Last Saturday we dodged the rain and drove to the Lowry Outlet Mall in Salford. I'd been before but not for years so this was quite exciting. The kids grumbled about it but then perked up when we mentioned Burger King. I was pleased to see that the Moulton Brown and Bodyshop stores were still there. As I've said before I LOVE Moulton Brown and I could have spent all day in there, there were so many good bargains. In the end I purchased a bag of 20 travel bodywashes and bodycreams including my favourite "Gingerlily" which I absolutely love, I think there were 16 bodywashes and 4 bodycreams. I also spent some time in the Bodyshop, conveniently located next door to Moulton Brownt. I confess I spent ages in there as its not a shop I go to really, I don't know why. After much browsing I bought a bodywash on sale and a calming foot spray that smells like mint. I really need to start taking notice of my feet, they really aren't pretty at the moment! www.allbeauty.com - up to 75% off RRP for fragrances, 60% RRP for self tan products and free Ultrasun Face worth £10 when you spend £15 or more on Ultrasun. www.lookfantastic.com - 20% off next order, free delivery worldwide and 30% off big brand shampoos, conditioners and treatment including Redken, Kerastase, Shu Uemura, TIGI and more. www.angelpharmacy.co.uk - save up to £50 on Nivea Sun cream products and there's also a sale on allergy products such as Piriteze, Piriton, Benadryl or Prevalin which might be useful for hayfever sufferers, I'm stocking up on Benadryl for my husband! www.feelunique.com - There's a 14 day offer comprising 50 products for only £5 each which includes nails.inc special effects nail varnishes, plus everything you ever needed to know about pastel purple nails. Hope you all have a lovely sunny weekend, see you next week. Now, I don't usually rave about soap, because, you know, soap is soap right? But I felt I just had to share this one with you. It's by Bayliss and Harding and its a Limited Edition. We go through a lot of liquid soap in our house as there's a lot of us and I'm a bit obsessive about hand washing. I usually buy what's cheapest (i.e. about £2) but I do go for moisturising hand soaps particularly as two of my boys are prone to eczema and harsher soap makes their hands very sore. This one jumped out at me in the supermarket (the soap/shower gel aisle is my favourite) because its pink (that doesn't show very well in the photo - sorry) and it smells like Strawberries and Cream and who wouldn't love that? Also, you get a LOT of soap for £2 which I think is a really good price. This soap is very moisturising and the smell lingers too. Bayliss and Harding do a range of soaps, body creams and shower and bath products, if you look carefully at the packaging its got a touch of the Moulton Brown look about it, the pump action top and the shape of the bottle. Its a pity this is a Limited Edition because I really like it, I'm going to see if there are any others next time I go shopping. Hi beautiful people, hope this week is being good to you. Today I've got a little review on the Bourjois Liner Pen, in Ultra Black. I've been using this for a while now, I'm relatively new to the whole upper eyeliner pen thing (being an old fashioned kohl pencil type of girl) because in the past I've always found I'm able to do one eye perfectly but not the other, thus ending up looking somewhat odd. However, I was determined to learn the art of this black liner flick thingy so I bought this and had a practice. My eye art skills still aren't great but I must say that with this pen I do manage a fairly good job. What I like about this pen is that the tip isn't too fine or too thick, I've had them before where I end up looking like a child who's just drawn on her eyelids with a fat felt tipped pen, not a good look for someone of my (pale) colouring and age! With this, I'm able to do either a very thin line or slightly thicker line with one sweep (if I linger too much that's where the mistakes come in!). This pen is also 24 hour lasting. It does last all day that's for sure but its not difficult to get off, for example its not waterproof, if you cry, sweat too much or get caught in very heavy rain it will smudge but it doesn't fade over time which is good, I think that's what they mean by lasting 24 hours. While I'm about it I'm also going to quickly say how much I love my Max Factor 2000 Calorie Mascara. I've been using it for about 100 years (actually only since 1998 - but that's a long time! ), it just works for me and suits my eyelashes, its got a great brush, is long lasting, and isn't a pain in the neck to wash off at the end of the day. I used to use Black/Brown but now I use Black just because it makes my lashes stand out a bit more. It's also not all that expensive. I'm very loyal to this mascara, I've tried others but really stick to the Max Factor brand because I know they suit me. The second Beauty Aware Weekly Round Up will be posted on Friday, I've got some good beauty offer codes this week and I'm working my way through the Anti Ageing Beauty Bible too! Its Mental Health Awareness week this week so I'll be talking a little bit about that too having experienced anxiety, stress, beta blockers etc. I was also going to bore you all with a story about my 6 year old wading through massive puddles at school and soaking his expensive Clarks school shoes so badly that they are still on the radiator and he's had to wear trainers to school the past two days much to the tut tutting of the headmaster but that's not really beauty related so I'll just leave that one out! Catch you later in the week! Hi there beauty bloggers, welcome to the Beauty Aware Weekly Round Up (I'm sorry, I couldn't think of a more exciting post title) which consists of all sorts of stuff that I want to tell you, but doesn't warrant a post all by itself, I've done little headings so it breaks it down a bit. I don't think the headings will be the same each week, I'll see how it goes, its a work in progress but I thought it would be good for me to do something other than reviews. 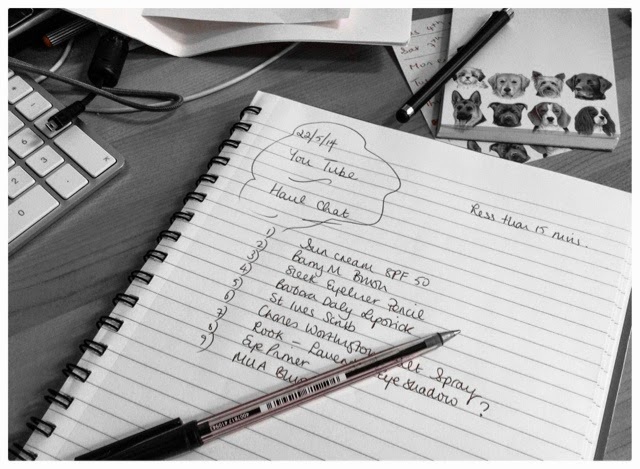 I've also recently tried to plan some sort of a blogging schedule because I've realised that I'm a bit erratic and I want to get into a routine. Well, that's the plan anyway! My replacement Boots Advantage Card arrived! I lost mine in January so I've missed many points (which is just so annoying), I'm really glad to have it back. I had "the bits of my hair that aren't red" tinted on Thursday at my local Toni & Guy Salon. To be fair, I've got very few grey hairs and nobody else notices them but me but they make me feel old. So they had to go! I feel better now. Its the first time I've had this done, I think I might be able to cover it up myself a bit cheaper though, I'm investigating an organic and mineral hair colour by Daniel Field which I might use in the future. I managed to lift 7.5kg weights at the gym for the second week in a row. My arms were absolutely pathetic (and a bit wobbly) when I started with this trainer, so I'm really quite proud that I can do this now. It's a pity I practically pass out every time I go on the rowing machine but hey ho, I'll get there! I was very excited when I got this book (pressie from husband at my request) as I'd read lots of great reviews on it and I really wanted to have a look. So far it's fantastic, loads of amazing tips that I will most definitely be taking notice of. This is my replacement for Zest Magazine which sadly ceased publication back in January, I've been reading it since it first came out years and years ago so it was a bit sad when they stopped producing it. However, I have to say I am loving Women's Health magazine, the format is really good. I was a bit worried it would be like the Men's Health version which seems to be all about getting enormous muscles and how to use the right chat up lines with women in nightclubs, but it's not, its a sensible, fun health and fitness magazine for women, loads of good exercise tips and some great beauty articles too. Its always in my make up bag and I've been using it for years but recently have tried different coloured lipsticks, mainly Coral ones for some reason. This one never fails for me though, it goes with everything and is really long lasting. I had this for my birthday last year, I love this smell, it reminds me of the summer. This is just a bit of a heads up on few offers from emails that I've been sent this week, I'm subscribed to all sorts of beauty and fashion websites so a lot of my emails are from them, I love making use of some of the discount codes, I do love a bargain! Mix and Match Shampoos, Conditioners and Hair Treatments. marksandspencer.com - Up to 50% off selected items in the online sale. Beautybay.com - 20% off Mychelle Dermateuticals Serious Hyluronic Firming Serum. So that's the end of my first round up, see you next week! Have a good weekend. Hey beautiful people, Summer's well on its way we're in May now, which means ... ta da ... this post is about my Favourite Beauty Products from April. Its a bit of an eclectic mix this month (check out the Sudocrem!) but these are the ones I've been reaching for continually. So, without further ado and to stop me rambling, here goes. I used Sudocrem A LOT last month! In fact for pretty much everything. I've always used it for the kids but never for myself but this month I've used it for eczema, dry skin and spots! Its really good stuff and I don't know why I haven't used it before. For dry skin and spots I used it at night so then I didn't have to put make up over it and it had all night to sink in, it leaves a bit of an unattractive white residue so its not really something you can put on before you go out but its definitely a good product. Plus you can buy it in the Supermarket in the baby section, you don't have to go anywhere special for it! This is a lovely neutral nail colour, it says it lasts for 7 days, I put on two coats and I have to say I didn't find it lasted that long without chipping but I am, as I've said before, very heavy handed and therefore this wasn't a surprise to me. What I did love about it is the shine, some nail varnishes start off shiny and then end up dull after a day or so, this doesn't. With two coats this is still shining away after a few days, its really lovely. Its also really quick drying, particularly after the first coat which is great if you do them just before bed or, like I did the other day, quickly flicked some on before I went out! This was an impulse buy I must admit, I spied it in Superdrug and it had 50% off. This is a lovely highlighter, I've been using it over a Revlon cream blusher I've been wearing to give it a bit of a shimmer. I've also used it on its own and it looks really pretty, its quite long lasting as well, I do like a product that lasts more than five minutes! I think its as good as my Bobbi Brown Shimmer Brick (Rose Shimmer) which has been a real favourite of mine for a few years now. I wrote a review on this lipstick way back at the beginning of the year, I used it then and decided it was more of a Spring colour so it went back in the make up bag but I got it out the other day (the sun was shining, I felt summery) and it did look better on me than it did back in the depths of Winter, that's for sure! Its a very creamy lipstick, it feels very luxurious as anyone who has ever used MAC will already know. Its definitely going to be a staple in my Summer make up bag now. So that's the April Faves done, it won't be five minutes until I'm thinking what May might be. Looking forward to reading everyone elses Favourites posts. Hey there beauty bloggers, I spied this tag whilst reading The Beautifully Disasterous blog and thought I would give it a whirl, it looked fun. Here goes! Nope, my mum just liked the name Maria. God, I cry all the time. At everything, happy and sad. The last time was about two weeks ago, I can't remember about what, probably a TV programme. Yes, I've got three boys, aged 9, 6 and 4. They are very noisy! Yes I think so. I'm very loyal and I'm always there for my friends. 6. Will you ever bungee jump? Absolutely, categorically NO! I'm terrified of heights, roller coasters and anything like that. So no to bungee jumping, it makes me feel faint thinking about it. 7. What's your favourite cereal? At the moment I am partial to Sainsburys Balance with Berries (i.e. supermarket Special K). Smiles, I like smiley people. 9. What's your eye colour? My eyes are brown. Everyone else in our house has blue eyes except the dog. Just me and the dog with the brown eyes! Definitely happy endings. I don't watch scary movies, my imagination runs riot! Ooh, baby powder, Poeme perfume, bacon sandwiches, and the way new cars smell inside. Summer - I'm a summer baby, I love the sunshine and the heat and the daylight. I'm a much more relaxed person in the summer. TV, although I do spend quite a lot of time on the computer these days. I think it's got to be Japan, I went there about 10 years ago. Not really, I can tap dance although I haven't done it for years. I was born in Milton Keynes. Pilates, blogging and going to the gym. I don't have time for anything else on top of my Mummy duties! 18. Do you have pets? Yes, we live with a lively three year old blonde Cockerpoo, he's beautiful. Apollo 13, no question. Space and Tom Hanks in one movie! Yes, I have two younger sisters, no brothers. I really enjoyed that! I'm tagging EVERYBODY! Yum, yum, yum, what can I say about this product. Oh yes, its yummy. 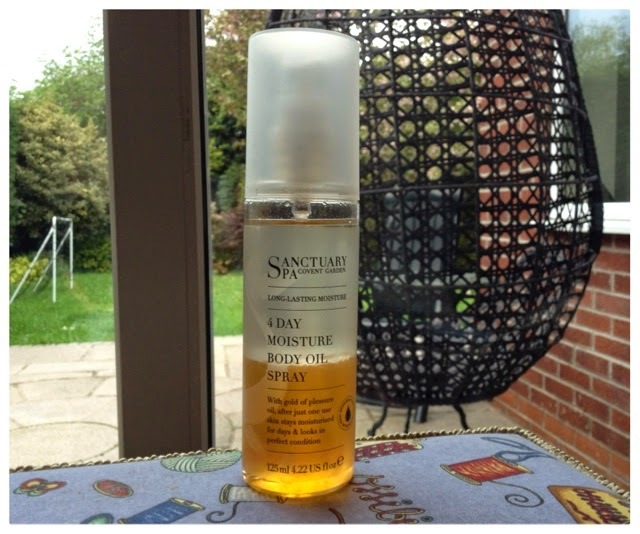 I absolutely love Sanctuary Spa products, love, love, love them. So when I spotted this in Boots the other day, it went straight in the basket. Unfortunately because I was distracted I came out of the shop without the thing I went in for but hey ho, don't need an excuse to go back to Boots do I, ha ha. Anyway, its really odd that I'm on such a moisturising kick at the moment with all the body moisturisers I've been using, because honestly I usually cannot be bothered with it (too lazy) but this lovely body oil spray is just scrummy and so quick to use. Its got the classic Sanctuary fragrance to it which is like a perfume that lingers gently for most of the day. The reason for the "4 day" label is that it is supposed to soften your skin for up to 4 days I'm not sure if it lasted 4 days but it definitely lasted a couple for sure. This is lovely product that I've been using every day and my skin (I use it predominantly on my arms at the moment as my legs are still covered by my jeans - lol) is very soft and I would definitely buy it again, its £7.00. You have to shake it first to mix the oil before you spray otherwise you don't get the full effect of the product. I also spied some Sanctuary Spa travel sized products when I was in Boots and as I'm on the lookout for nice ones for my holiday I think I might go back and get them too. Is anyone else a fan of Sanctuary Spa? Have a lovely Bank Holiday Weekend! I hear we might be OK weather wise in the UK at least until Monday (fingers crossed). Hey there beautiful people, todays post is on my most favourite eyeshadow palette of the moment, purchased from Beautybay.com. I love the range colours, they completely suit me because they aren't too "in your face" as it were and beautifully blendable (is blendable a word? I think not, never mind). Anyway, enough rambling. Please check out the short video below to see a full review and the colours in "real life". Posts People Like to Read! Copyright 2017 Maria Byrom for Beauty Aware. Powered by Blogger. Read Posts on your Favourite Brands! © Beauty Aware | All rights reserved.